At the word "Go" everyone tries to make their Ants jump into their Pants! Press your finger down on the tail of the Ant. As your finger slips off, your ant will jump out - oops, there it goes! Now try another one. If you're the first to get all of your Ants in the Pants, you win! 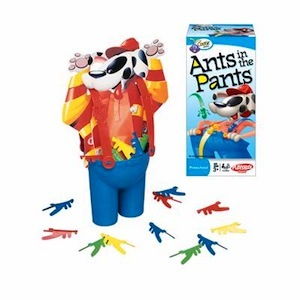 Press down the ants and make them jump into the pants in this classic preschool game! Includes 16 ants, 1 pair of pants, and 1 pair of suspenders. For 2-4 players. Ages 3-6.